LAKE ELSINORE, Calif. (AP) -- Aided by slightly cooler temperatures, firefighters made steady progress Sunday in battling a wildfire that destroyed 16 structures as it raged through Southern California’s Cleveland National Forest. The Holy Fire was 41 percent contained Sunday afternoon after burning across 35.5 square miles (92 kilometers) of dry timber and brush, said Lynne Tolmachoff of the California Department of Forestry and Fire Protection. 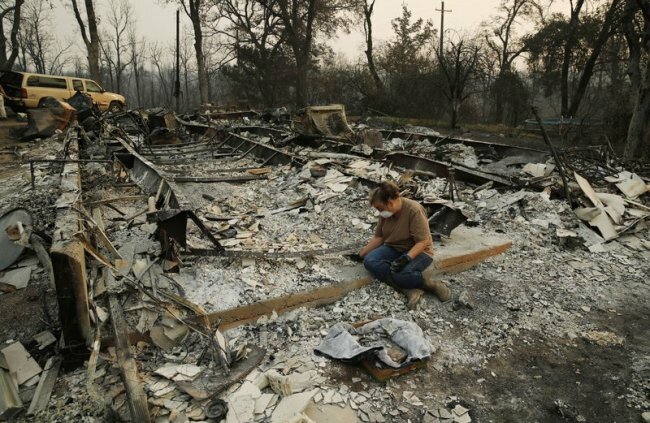 Elsewhere, the largest wildfire ever recorded in California — the Mendocino Complex — burning north of Sacramento destroyed more than 100 homes. It was nearly 70 percent contained Saturday. Updated containment figures were not immediately available Sunday. On Saturday it had covered 508 square miles (1,315 sq. kilometers).